Discover Antarctica intimately with a small ship expedition on the Polar Pioneer Cruise. The Polar Pioneer is one of the smallest yet sturdiest Antarctic cruise ships. Built in 1982 and used for polar study and research, the ice strengthened vessel was refurbished in 2000 into a passenger ship accommodating a maximum 54 guests. The smaller size of the ship means she can navigate in areas larger vessels can’t and that the experience onboard is incredibly intimate. Discover Antarctica in an intimate way on one of the smallest passenger Antarctic cruises. You can spend your days in Antarctica observing the wildlife from the spacious bridge or the Polar Pioneer’s ample deck areas. Relax in the polar lounge in between onboard seminar presentations and lectures. Meals are served in either of the two dining areas or even warm up in the sauna after your antarctic landings. Daily zodiac excursions and Antarctic landings are carried out to get you to experience the seventh continent firsthand. The Polar Pioneer Cruise has triple, twin and suite cabins all with portholes or windows and come in a choice of shared or private bathroom facilities. The are 2 Triple Cabins with shared bathroom, 9 Twin Public (with shared facilities) and 12 Twin Private cabins with lower bunks (except cabin 402 and 403.) 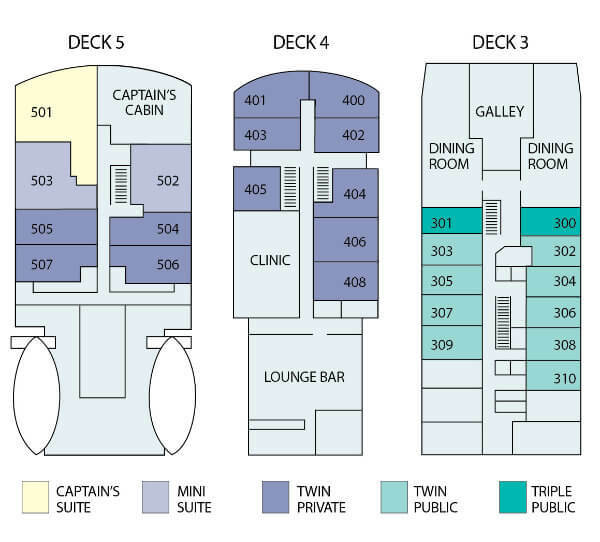 The 2 Mini Suites offer a double bed and Captain’s Suite has a lounge and table area. There are a number of ways you can make your Antarctic experience on the Polar Pioneer even more special with a range of special Antarctic activities. Most Polar Pioneer departures will include the ability to kayak in Antarctic waters, whilst selected dates will offer Antarctic camping, Mountaineering, Diving & Snorkelling options for an additional rate. There are Special Antarctic Photography departures with either workshops led by experienced crew and even a Masterclass led by Australian Geographic’s Chris Bray. You can even attempt to mimic the epic crossing made by iconic explore Shackleton when on South Georgia. Ice Strengthened Vessel originally built for polar research and refurbished to accommodate passengers comfortably. Includes shipboard accommodation with daily cabin service, meals and snacks on board, activity and lecture program including zodiac rides, rubber boots for use on board, waterproof polar jacket, photobook of images taken onboard,flights as part of fly cruise program, port taxes, charges and landing fees. Excludes flights and accommodation to Punta Arenas or Ushuaia, visas, passports, personal expenses and tips. Bonus waterproof polar jacket for all passengers and photobook as a keepsake. You want the most intimate small ship experience of Antarctica possible. Confirm your cruise details and cabin type you want to check availability for.